Over the years myself and a few other like minded individuals have pioneered a technique which has become known as "true-scale"
a process that involves making marines bigger basically. For myself this began way back in 2002 with my White Scorpion marines seen below. Not content with regular plastics I wanted something bigger that fitted with the background materia and artworkl surrounding the Astartes. I wanted larger than life heroes. 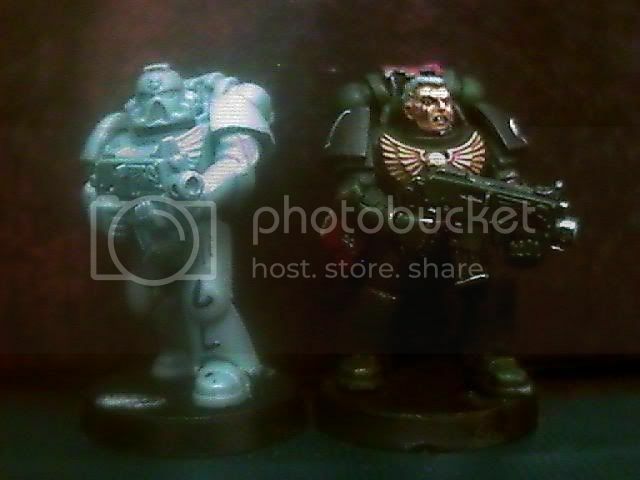 This process was later refined leading to my Pre-Heresy World Eaters and the more successful Gothic pattern marines which I created initially for a Dark Angels army and later used on my Pre-Heresy Night Lords. None of which were ever finished except for the captain but both provided me with an invaluable insight to how to make marines look that more imposing on the tabletop. The Truescale marines that came about as a result this process lead me to create the latest incarnation that most people associate with Truescale and is an attempt to make marines that look the part of the eight foot warriors that they are. 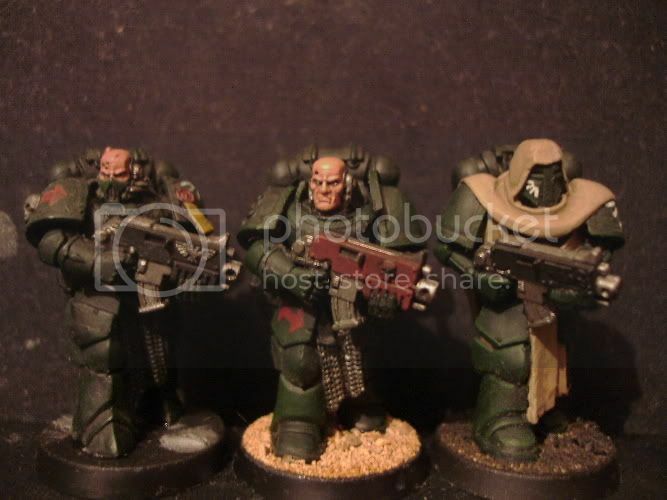 So in short they look more like the marines that you see in the likes of Dawn of War II or infamous Crimson Fist marine as seen in the fourth edition rule book. Compared to regular human models they stand towering over the regular plastic marines and terrifying your opponents. Over the next few updates to this tutorial I will be providing details of the my most requested tutorial to date, hopefully catering to most skill levels. After years of toying around with the concept of truescale marines this is probably the most used method for creating bigger marines in the hobby to day. Although the process had become mostly associated with Pre-Heresy I will be demonstrating different techniques that will allow you to include these behemoths in your regular and Chaos Space Marine armies. Edited by Doghouse, 27 July 2011 - 11:57 PM. Sculpting/modeling tools such as the GW sculpting tool, a sharp modeling knife, clippers, etc. Spare weapons such as bolters. Creating one of these Astartes will seem daunting at first due to the amount of greenstuff work involved but don't be put off just yet. I'll be doing my best to provide step by step instructions that will result in something that looks like this guy here. With a bit of practice and experiance you'll be able to create more varied positions and armour variants but for the time being we will be focusing on constructing a stripped down Mk VII marine. 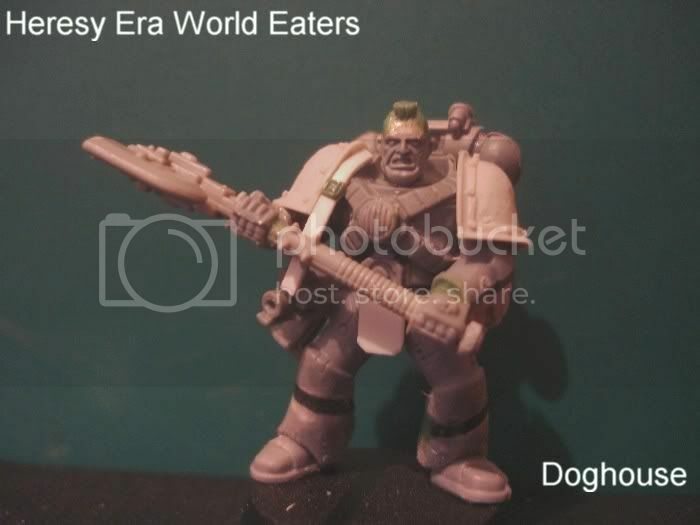 so in response to my question would i basically have to either sculpt or plasticard in extentions if i were to do this for terminators? oh wow...these look amazing, Doghouse! is there no limit to your powers? id love to make a bunch of these, for sure! i think i can see how construction works - best of luck making that Tutorial - i'll be reading it! Blood Scorpions - completed vow here!! 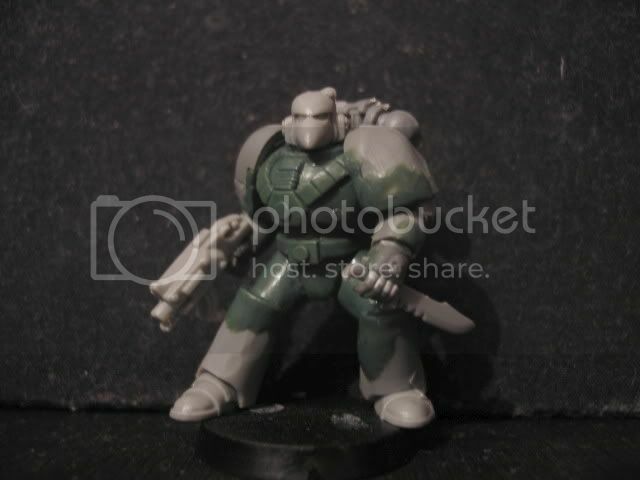 Couldn't you do plasticard to space out a normal marine torso, maybe even do something like that for the arms and bulk the out with green stuff? I don't exactly have 9 sets of Storm Shield arms lying around. I can't imagine many people do. I love the concept, though. 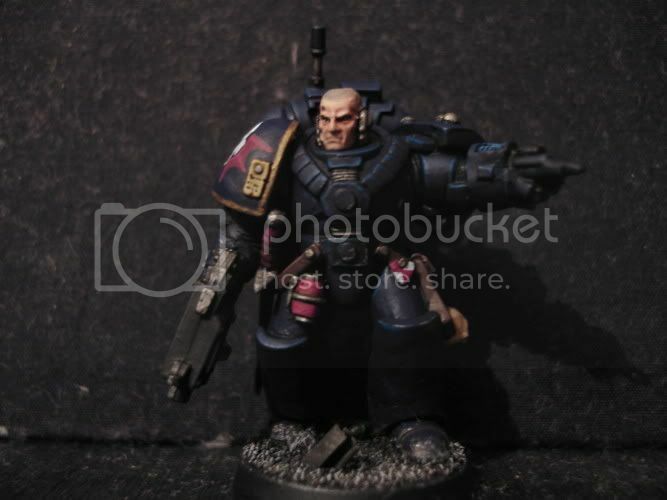 The pre-heresy Night Lord captain or sergeant looks like a true astartes, mate. The Cult of Orange : No one can withstand our...color. Raise your weapons and march away, to glory, my brothers, and to a bloody day! always phenomenal doghouse continue continue! EDIT: Never mind. I really don't want anything to do with this thread. RAISE PROSPERO, FOR RUSS, FOR THE WARMASTER. FOR THE EMPEROR!! youre back Oh my god thank you, i missed your tutorials and advice terribly welcome back! I wish I had that kind of free time. I don't think I would bother wearing anything else. Wow, Doghouse, that mini with the termie parts is awesome. Corax-rg a.k.a Chris O’Hanlon. I have been playing chaos for little over a year, and has been in the hobby almost two. I play for fun, winning isn’t really very important. Enjoy the game and it will be more rewarding the times you do win. I am much interested Doghouse! I was actually in the process of planning my next force. A force of berserkers and this is just the thing I need to make them stand out and scare the world! Lookin forward to the rest of this tutorial. keep me posted. Laugh, or you will go Crazy. Thanks for your support guys, the second part will be up asap. Throne alive! tell me those are real! and if they are, how are they made, i must know how these are made! @ Brother Zim. 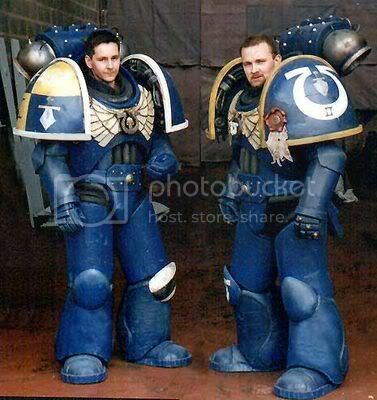 a Member of the B&C once made a guide to build SM suits. they were slightly better than the aforementioned marines. im sorry i dont know where from, but you could use Searchy-fu or look around. They're from www.nimbacreations.com. Apparently they were used in a game called "Final Liberation". Some Epic 40k game or something. I've seen plenty of other suits but I think these ones take the cake thus far. yeah, i fired off an email to the guys at nimbus creations asking for ideas about how to make them, but as for using searchy-fu, i wouldnt even know what start searching for, not that its goign to stop me! Edited by Firenze, 08 March 2008 - 12:59 PM. hmmm... any chance of an update doghouse? The grammar used to argue for "good grammar" is terrible. Will be up asap, I'm completely snowed under with real life stuff at the moment. Awsome! The Grand Master of True Scale is back! I knew the call of plastic was to strong to keep you away for long! That's the problem with the internet. Back in the good ol'days, each village had to endure it's own idiot. But now one has to deal with idiots from villages around the world. When in doubt follow the rule of cool. Y'know for all of their sado-masochist hedonistic tendancies, I'll never understand why not a single one of the EC went to Fabius Bile, pointed at their nether-regions and said, "While you're cutting me open, think you can get these working again?" yay i can't wait... I'll only be making one batch.